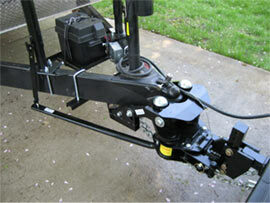 ProPride 3P Trailer Sway Control Hitch eliminates trailer sway. This could make for a great gift for the road enthusiast in your life or a great addition to your trailer for safe traveling this holiday season. Ease the stress and keep you and your family safe while you’re on the roads with ProPride 3P. This Pro Pride product is backed by a lifetime warranty and has a proven customer satisfaction record. Shop online at www.propridehitch.com, for the next generation in hitches and eliminate trailer sway.